We continued prospective assessments of the Wilma–solvated interaction energy (SIE) platform for pose prediction, binding affinity prediction, and virtual screening on the challenging SAMPL4 data sets including the HIV-integrase inhibitor and two host–guest systems. New features of the docking algorithm and scoring function are tested here prospectively for the first time. Wilma–SIE provides good correlations with actual binding affinities over a wide range of binding affinities that includes strong binders as in the case of SAMPL4 host–guest systems. Absolute binding affinities are also reproduced with appropriate training of the scoring function on available data sets or from comparative estimation of the change in target’s vibrational entropy. Even when binding modes are known, SIE predictions lack correlation with experimental affinities within dynamic ranges below 2 kcal/mol as in the case of HIV-integrase ligands, but they correctly signaled the narrowness of the dynamic range. Using a common protein structure for all ligands can reduce the noise, while incorporating a more sophisticated solvation treatment improves absolute predictions. The HIV-integrase virtual screening data set consists of promiscuous weak binders with relatively high flexibility and thus it falls outside of the applicability domain of the Wilma–SIE docking platform. 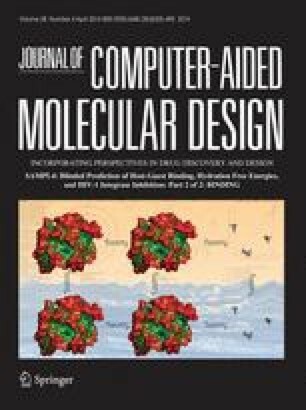 Despite these difficulties, unbiased docking around three known binding sites of the enzyme resulted in over a third of ligands being docked within 2 Å from their actual poses and over half of the ligands docked in the correct site, leading to better-than-random virtual screening results. The online version of this article (doi: 10.1007/s10822-014-9715-5) contains supplementary material, which is available to authorized users. This is NRC Canada publication number 53222.